It’s all the rage to talk about a Dystopia these days: a future filled with despair and desperation, not hope and joy. From The Hunger Games to The Walking Dead to Revolution to World War Z, there’s a ton of media offerings that depict a dark future where humanity has to learn to live in a reduced way than they do today. So it is easy to talk about a dystopia. It is harder to talk about a future that looks brighter–and harder still to talk about how to get there. This past week, we discussed four blog posts outlining techniques of megachurches. Each example church does these techniques well, and I wasn’t out to speak badly of them. Church of the Resurrection, in particular, was singled out not because they are a terrible church (the exact opposite!) but because I am afraid of the widespread effect of their practices. Their strategy is perfect for them and they execute it well. My argument, rather, is that widespread uncritical use of those techniques is problematic. So I am fearful of the four techniques becoming more widespread without serious accountability and execution standards. That was the series last week. But it is not enough to critique without championing a better way to serve as a corrective to these techniques. There must be an approach to augment and channel these techniques into replicable approaches that better all of United Methodism. The good news? 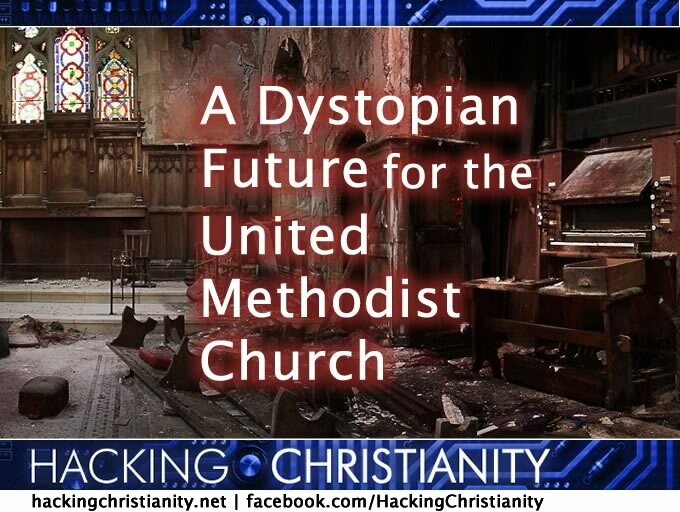 The United Methodist Church, as a connectional entity, actually has a reasonable solution to most of the problematic elements. And as a connectional church, it is best positioned to show the non-denominational churches and independent churches the best way to counter these problematic elements in their own churches. Multi-site initiatives must take place in towns other than the one the large church is in. Not across town. Not across the stream or the tracks. But in a town or region a particular distance away. The first concern is the consumerism is an unchecked factor in a multi-site approach. By offering to take over smaller churches in strategic locations, the effect is that bigger churches do not have an incentive to help struggling churches turn themselves around until they enter into a relationship (be that partnership or abdication) with the bigger church. By using the simple requirement, large churches will be forced to do serious missional consideration and listen more to the local context because the town will not be as familiar to them. But likewise, the large church will be wanting to lift up and assist the small struggling churches in their town. Otherwise, another large church from another town could plant a multi-site in their town. Exceptions could be made, of course, I suppose. While this adds another level of bureaucracy and restrictions, it does counter the primary concern of consumeristic takeovers of small churches surrounding a larger church. If a church is missionally focused on a multi-site approach, doing a church of many houses in many towns will not dissuade their mission strategy. The second concern is that piped sermons replaces a diverse connectional UMC presence with a uniform sub-franchise within United Methodism. The easy availability of megawatt high-capacity sermons coming digitally does not give local churches the incentive to opt-into different preachers or styles of ministry. By using the simple requirement, churches will be forced to move beyond their context into new contexts, where the sermons may or may not be applicable. The campus pastors of those multi-site locations could then re-preach the same sermon using their own examples, verbal quirks, and adaptions. Or they invert the sermon process: instead of one site sending their sermons to the multi-sites, this could lead to a writing of the sermons collaboratively with the senior pastor. While this negates the primary cost-cutting and celebrity benefit of piped sermons, it does counter the franchise tendency of a single voice taking over a multiplicity of locations. And instead of abdicating the pulpit to an external voice (or use the external voice once or twice a month rather than every week), it could lead to collaborative efforts that better both the relevancy of the piped message and the preaching skills of the campus pastors. The third concern is that a production model of worship planning (what sermon series can we package and sell?) is not only theologically problematic but would lead to a drastic reduction in the use of the ecclesial discipline of The Lectionary. The comments on this topic were quite contentious with professors and liturgistas debating the lectionary/topical piece. By using this simple requirement….well, honestly, it does little to address this point. Out of the four dystopian futures, sermon series and production model of church are not dependent on multi-site locations. Although most multi-sites do use sermon series models, especially if they use piped sermons, it is not required nor really impacted by this suggestion. I then told them that we were going to tell the whole story of Jesus through the year – from the people crying out for a Savior, through his birth and life and death, resurrection, Pentecost, all of it. I also told them that we’d be doing this at the same time as Christians around the world. They loved it. I didn’t throw it on them as “we have to do this” – but more as “Christians have been doing this for a long time, and here’s why, and here’s why it still works today.” It’s a story that they get to experience – not some dead tradition that tells the preacher what to preach. I think it’s incredibly important because it’s something the church does together – it connects Christians around the world as we relive the primary stories of our faith, over and over, instead of just what I as the pastor think would be a cute series. It broadens the church beyond its own doors to worship in unison with so many others. I can’t come up with any series that good. If a church is serious about ways to increase a one-ness of the church and resist the fragmentation that is felt ever more present in our daily lives, then using the Lectionary–and not writing out the possibility of it by using exclusively sermon series–ought to be a consideration. By using the simple requirement and creating more distance between sites, pastors will have to have more traditional skillsets than being mere implementers of the mothership’s resources. These pastors will become more missional and will report back how the mothership’s theology and practices gel with the other communities. Then even if there are piped sermons and resources coming directly from the top, the influence of different social groups and areas will result in more holistic preaching. While this seriously disrupts the evangelism model of multi-site (ie. they have figured out a culture, why not expand within that culture? ), it does truly turn it to be missional rather than a distributed attractional model. In short, the multi-site and production strategy has many incredible things going for it. And there are many incredible practitioners of these techniques. As a denomination, we are bettered by these practitioners and would do well to emulate them to a point. However, throughout this series we’ve discussed what might happen if these techniques become widespread. It is my observation that perhaps the United Methodist Church is best suited to serve as a corrective to this multi-site movement not by limiting the mission field but by encouraging an expansion of it. By requiring multi-site plants to be beyond their borders, such campuses become more missional and less uniform in their expression of the mothership mission while retaining the ecclesiological concern of the original Methodist movement. Grandfathered current sites and exceptions can be made, of course. Corrective measures seem at first to be backwards-moving and stifling of innovation. While it serves as a short-term “regulation” that may prohibit some multi-site efforts, in the long term encouraging “the world is my parish” mentality of multi-site initiatives could transform the entire movement to be more innovative, missional, and upholding of UMC ecclesiology than unchecked multi-site growth. The UMC is best positioned to make this positive contribution to this growing phenomenon. Thoughts? Post below in the comments! Welcome to our visitors and thanks for our readers for encouraging a fifth post! Some might call this a parish or circuit model also! Seriously, this is scalable even to places that don’t have a megachurch. I serve a county-seat congregation that’s on the small end of medium-sized in my conference (125ish average worship attendance) and we are grouped into a subdistrict with significantly smaller, out-in-the-county churches. Adopting this model for us would mean working with local pastors & certified lay ministers to bring out the best in our connection system. That’s a big shift for many of our congregations, small, medium, and mega alike. I don’t know if it would work in more rural settings! (Are any of my people reading this comment? It’s just an idea!) We are so used to a church with a pastor (or many pastors), not a network of churches, clergy, and mission fields. But I think I read somewhere about someone who thought the world was our parish. So there’s that. Seriously, you basically just described the traditional Wesleyan Circuit. It’s amazing to me the more I find out about the current issues of the UMC through seminary eyes fresh out of Methodist History and a really good Polity class, WE HAVE THE FIXES! Our problems are mostly because we’ve drifted away from the original connectional model of accountability groups and conferencing. I think we should be swapping preachers all the time! If we have decided that what comes from the pulpit (or screen) every week is the pivotal point of our ministry, I think we’re really missing the point of what it means to be Methodist. Go back to basics. It will amaze your congregation. Interestingly this is the exact model we are playing with in Yellowstone Conference. We have several churches because of budget and geography can’t have a pastor with them every Sunday. We did an experiment with one, providing sermon’s via video, and it was a great success. The truth is, sermon’s freak people out, and doing it well is difficult. So, when the laity were freed to work on other areas of worship they were grateful. We also used a variety of people for the experiment, and sense this has been an on going critique of this blog, 3 were women and 2 were men. I’ve heard tell that Path 1 is in the process of developing a library of sermon’s for this purpose, but we decided not to wait around for them.